Now Superman's attention turns to his family, now all sporting a new last name, 'Smith' and a new home in Hamilton County. Jon, Lois & Clark's son, watches in awe one night as his dad saves their new home, the Smith Farm and its livestock from a fire. A stunning site of heroism... but the next morning Lois & Clark are cleaning up the mess while an excitable Jon is eager to help and explore his burgeoning powers. Clark promises to allow Jon to help if his son keeps his powers in check in public. Jon promises and races eagerly with his cat Goldie to fill up the corn harvester. As the two race through the fields they don't notice that an eagle has been circling them. As it swoops down on Goldie Jon lets his emotions get the better of him and unleashes his heat vision, the result is an explosion of feathers and the horrifying sight of poor Goldie burnt to a crisp. Jon is horrified at what has happened and that he broke his promise to his father, worse still he realizes a young girl had seen the whole thing happen. As he returns home Clark offers to help him explore his powers while rebuilding the barn but is taken aback when his excitable boy turns him down. Over dinner Lois discusses her writing and notices that Goldie hasn't come home. Jon lies that he hasn't seen her and a knock at the door interrupts any further probing. Kathy Branden introduces herself on behalf of her family in the neighboring dairy farm. Bringing over a gift of local produce Kathy politely explains why they hadn't been over to visit before now but then she spies Jon. Lois quizzes her on Goldie and a relieved Jon sighs when Kathy doesn't reveal the truth and leaves. The events clearly weigh heavily upon Jon and when Lois & Clark talk about fitting in and making friends Jon's temper gets the better of him. He hates lies and hates that his mother & father seem to condone them. Clark sends Jon to cool down in his room and the tearful boy sits looking out his window. As the sky darkens two shadowy figures appear on the Smith Farm. Jon recognizes them as Wonder Woman & Batman. As Clark, garbed in his costume steps outside to join them Jon can't resist using his powers to eavesdrop but he isn't stealthy and he's spotted by the superheroes. Jon sits in the dark for a few seconds hoping everything would go away but his door opens and Superman cooly instructs his son that they are leaving to talk. 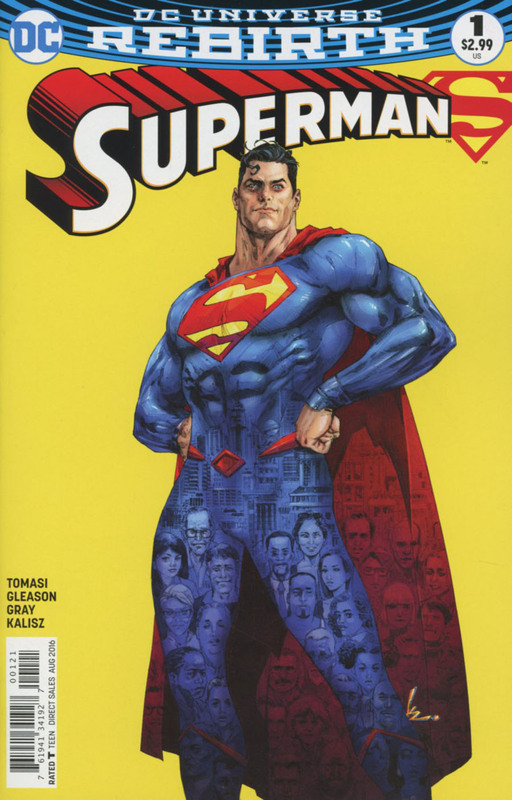 Story - 5: Secrets & lies... that is what we have here and it expands for a really good read and a great opening to the new direction of the Superman mythos in modern continuity. People often complain that Superman is too powerful and that he can 'end a fight in seconds', those people don't often read comics and were also those to argue the point with the recent Batman v Superman movie, so it is great to have a book that isn't focusing on punching things and instead one that is willing to explore the human dramas and maybe open their eyes a little that Superman is more than a fist fighter. There are interesting parallels to be drawn here not only with Action Comics but with Superman's past. In terms of Action, this is clearly the book exploring the character and his relationships, while that book runs full steam ahead into fisticuffs. Very little happens in terms of 'Super Feats' but the emotional dial is turned up to 10, and I'm really ok with that. I'm not too interested in the glowing hand or Mr. Oz references, as far as I'm concerned that's in the 'file away and think about later' category. I was more taken into the goodbye from Clark and his inner turmoil at being unable to bring the Superman of this earth back. Not only that, but the immense responsibility of coming out of the closet to be Superman again and taking over the legacy. Then there is Jon, his accidental killing of Goldie, it plays out in a similar way to Hyperion killing his family dog in 'Supreme Power' a few years back, but it is the catalyst to a new direction. Jon gets his 'Lana Lang' in the form of Kathy Branden, which is a nice nod to the classic stories. Jon is in a unique place. He isn't Damian Wayne, not by a long shot, he's a real happy go lucky kid who has suddenly had his world turned upside down. His struggles are genuine and heartfelt and his argument with Lois & Clark was a real turning point. It is true that the Smiths have built their lives entirely on lies, for the greater good, but lies nonetheless. Jon's argument that he can't ever be truly honest with anyone because of the lies enforced upon him are valid and at least now he has a sheepish but genuine confidante in Kathy. It's interesting that this book is willing to take chances like this. Giving drama the driving force is welcome and makes for some truly immersive reading. Clark sharing the spotlight with his family certainly shakes things up a bit, and it will be interesting to see how the men of the family going into super-heroism will affect the new status quo that is the Smith Farm. Parenting is new to Clark, and the book takes a noticeably dark turn when Goldie dies and the argument in the kitchen spins the dynamics in their head with a question that is fundamentally at Superman's core - the art of lying and the keeping of secrets. Clark suddenly becomes very serious with Jon, and it is true now that he is Superman, Jon can't be a giddy little kid anymore, he has to mature and be responsible as he is essentially a tiny Superman. I guess as the story moves along we'll see the wide eyed boy 'man up'. Jon doesn't have the idyllic introduction to the trinity he had hoped for and nor the introduction to Superman either, all seem very serious and in truth this is well placed considering who he is. 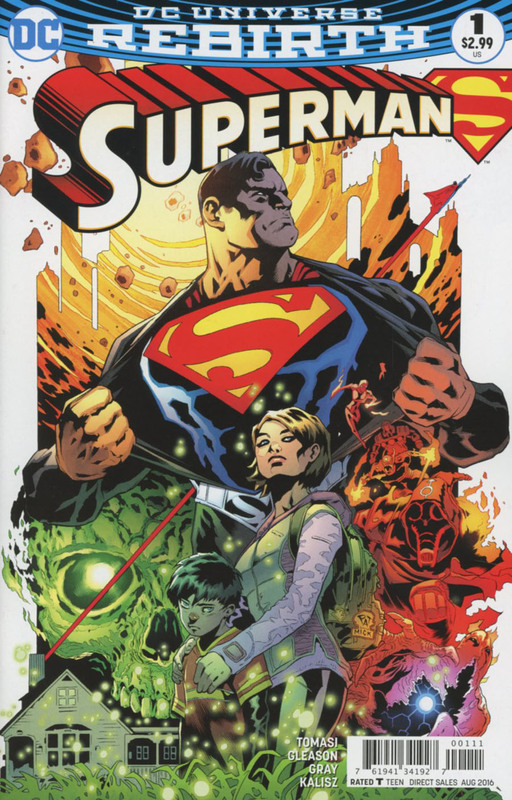 I do want more Lois & Clark, I'll be honest, but a Superman Family has been long overdue and in modern times its something we might need to look to. I look forward to seeing with Tomasi & Gleason have in store for us! Art - 5: The art, like the story, takes a few twists. It is dark and foreboding when it needs to be and light and energetic too. That in itself is a difficult balance, because as mentioned there really isn't much that happens in the book that is 'Super' this issue at least. It is all about the people and the dark moments with Clark's psyche polarized with those light moments with a rugrat Jon. You really felt like you were stepping into Jon's shoes, especially when you saw the disapproving looks glared from the trinity! It was also nice by the way to have the shield back to being the universally recognizable one. Cover Art - 4: The cover is a great explosive image but proves a bit busy. So much is going on that it is hard to focus on what it is trying to tell us. Couple in the primary color palette and it gets even busier. I don't need teases of future storylines, just cutting out everything but Lois, Clark and Jon makes for a more powerful image.